Najomtien officials and residents toss effective micro-organism balls into a Moo 1 canal to purify the smelly water. Najomtien officials and residents tossed 3,000 effective micro-organism balls into a Moo 1 canal to purify the smelly water. 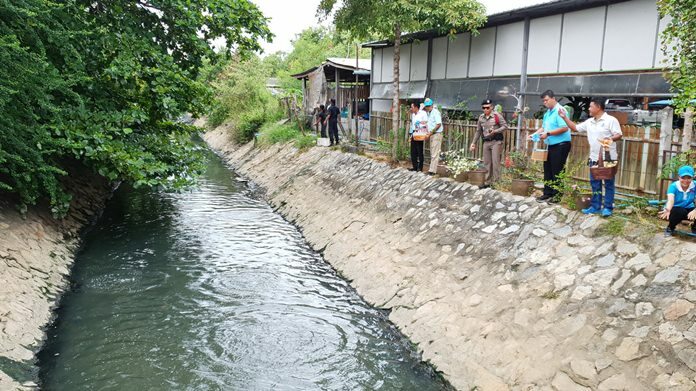 Village chief Somsak Tubklad said sewage had been pouring into the waterway behind Najomtien Temple at the end of Soi Ton Had, with the black water emptying into the sea causing pollution problems for residents and fishermen. It was hoped the “bio balls” would clear up the putrid water. However, officials acknowledged the EM balls were just a temporary fix and the cause of the wastewater spills into the canal has to be found and stopped.